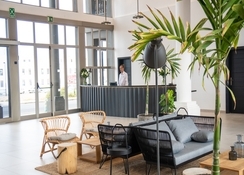 Hotel Cotillo Beach is a budget hotel that offers half-board and all-inclusive boarding options. 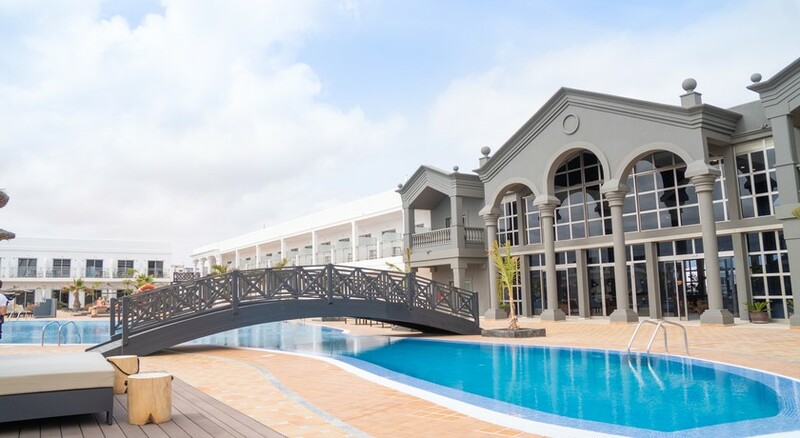 Mostly visited by families, couples and large groups of friends, this is a sea front hotel. It is away from all the city commotions, ideal for a memorable serene holiday. This beautiful property is just 3 minutes’ walk from the nearest beach. A large freshwater pool, a buffet restaurant and rooms with a balcony await guests for a comfortable stay amidst warm hospitality. There are fully-furnished rooms with flat-screen TV at the hotel. The Cotillo Beach and the Spew Pits surf spot, a hub of fun activities is only 500m away. The hotel offers tennis courts, gardens and a children’s play area and guests can relax on a lounger on the lovely poolside terrace. 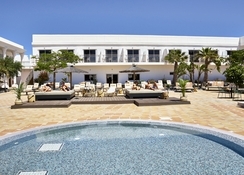 Cotillo Beach Hotel is a three-star hotel located in El Cotillo (Fuerteventura). The hotel is just 250 metres from a white sandy beach. There are few shops, restaurants and bars around the hotel—you can also visit villages like el Roque, Toston, Lajares and etc. for shopping and sightseeing. There are rocky shores in the surrounding and you can go for snorkelling and scuba diving, otherwise this is a place for travellers looking for a relaxed seaside holiday. The Fuerteventura Airport is about 46km from the hotel, while the town of Corralejo is 21.4km. 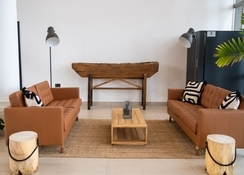 Guestrooms in Cotillo Beach Hotel are divided into two categories, superior and one-bedroom. These rooms are spacious furnished with modern facilities to guests a comfortable stay. The décor is very simple, finished in light colours. You can select between double bed and twin bed and pool view and neighbourhood view. 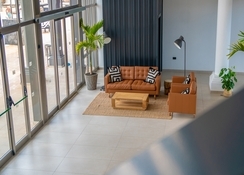 Facilities you will find in the rooms are TV with satellite, ceiling fan, private bath room with amenities, sofa/couch, hairdryer, balcony, Wi-Fi, safe deposit box, telephone and much more. You can request for extra bed and crib—housekeeping is provided daily and fresh linen and towels are available when requested or required. The hotel features a buffet restaurant that serves breakfast (8am - 10am), lunch (1pm - 2:30pm) and dinner (7pm - 9:30pm). You can look forward to continental breakfast with an array of selection on the spread. At lunch and dinner, you will find Spanish, International and Mediterranean cuisines, complimented by desserts and alcoholic drinks. The hotel organises theme dinners regularly and features live show cooking daily. In addition, the pool bar (10am - 7pm) is where snacks and light meals are served during day time—you can also enjoy beverages menu that caters to cocktails and mocktails and other alcoholic and non-alcoholic drinks. In the evenings, the main restaurant does get quite busy as this is where an extensive alcohol menu is served. There is a large outdoor swimming pool with a kid’s paddle pool in the surrounding. Parasols and loungers are complimentary—approach the front desk for lilos and beach towels—food and drinks are served around the pools. Children between 4 – 12 years can join the mini club and partake in various workshops and activities. You can play water polo, water volleyball and water gymnasium or table tennis, darts, billiards and etc. There is a travel desk and besides organizing land and sea excursions, you can also rent bikes and bicycles. And in the evening there is animation and entertainment every now and then. The hotel is in a lovely location, the beach is literally a 2 minute walk away. Corralejo is 20 to 30 minutes on the bus which is also a reasonable price journey, It's great for a day out. It's windy but it's expected but in the heat it doesn't make it cold it stays pretty warm till the late evening. The food was hit and miss some nights as we went all inclusive, however on nights when you don't fancy their food there are some great little places too eat around the town. The staff were really friendly and helpful it was nice to be looked after when we didn't know something. The facilities were great we were either poolside or downstairs playing ping pong which is great fun! On some nights they have entertainment on which is really good especially the karaoke. The local area is also great for a walk around after lunch and dinner. Overall a wonderful relaxing holiday with a comfortable room which is lovely and clean! Ok holiday .. wouldn't go again! Ok for a quick get away in the sun . Ok rooms , clean sheets and towels. Food ok , nothing special but tasty. Lots of smoking in public places.!!! Pool clean and tested everyday! Rooms not sound proof , so you can hear your neighbours! Rooms facing onto the road are really noisy! Hotel was lovely, rooms were cleaned and beds made every day, staff were amazing, so helpful and friendly, we were all inclusive and I must say the food was fab, always plenty of choice to suit every taste, I would go to this hotel again. The hotel and all there staff are happy to help with anything. The room was a good size and well appoited. Fabulous relaxing break, just what two hard working NHS colleagues needed, very comfortable room with balcony overlooking the pool, we found this hotel quiet and very chilled, reasonable food with theme nights, very friendly, helpful and courteous staff, entertainment was available if you wanted it, regular daily activities if you wanted to partake...but we were more than happy to soak up the sun and read. Beautiful town an spectacular beach walks, the icing on the cake was the beautiful white hotel cat family....hopefully the guests since us have continued to feed them!! Really nice place and very helpful staff. Quite a windy area and very cold pool, so cold no one would go in. A really lovely, well presented hotel with modern and convenient rooms and facilities perfect for our holiday (young couple). The pools were lovely to stay around the hotel but equally some beautiful beaches are only a short walk away. Area seems quiet on first arrival but a short walk reveals some lovely restaurants, cafés and bars for lunch, dinner or a few drinks of an evening - so advice would be to not be deceived by the initial quiet and have a walk around as there are some true hidden gems that make for a lovely evening in what feels like an authentic part of the Island. The food at the hotel (half-board) was as expected - we enjoyed breakfast on a few occasions but also sometimes bought from the small supermarket literally next to the hotel if we wanted more flexibility. The dinners were of average hotel quality, nothing spectacular but something for everyone should they wish to eat in - but as aforementioned there were lovely restaurants in the area so we chose to eat out most nights - but was no hamper to our experience as it was nice to know the option was there if we wanted it. Also a nice option to trade out a meal for a lunch on some days which was handy. Overall staff were polite and helpful, and the room cleaning was always to a very high standard. No complaints whatsoever, a lovely hotel which was excellent value for money and made for a wonderful holiday. This is a Perfect base, Hotel is clean and well equipped but limited facilities in the room (No Tea or Coffee Facilities). I am a very fussy eater so the food would not get my biggest vote, But it was clean, hot and others seemed to enjoy it.